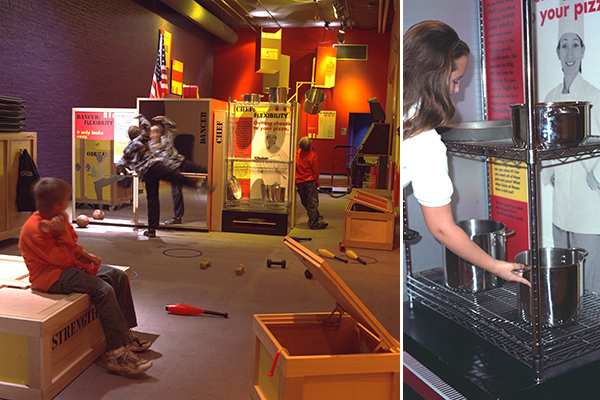 Louisville Science Museum: Get FIT! 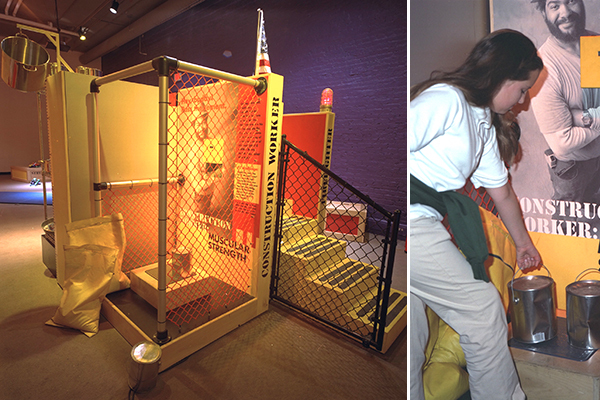 Growing health and weight concerns led to the development of this traveling exhibit, which delivers the “Get Fit” message in fun and challenging ways. Geared for 8 to 14-year-olds who average four hours a day in front of TV’s, computers, and video games, the Get FIT Lab gets hearts pounding and bodies moving. ° Type 2 Diabetes, unheard of in youth 10 to 15 years ago, is increasing dramatically. ° Obesity has been linked to increased risk of cancer, heart disease, stroke, and diabetes among adults. ° Overweight adolescents do not tend to change their habits and most remain overweight into adulthood. 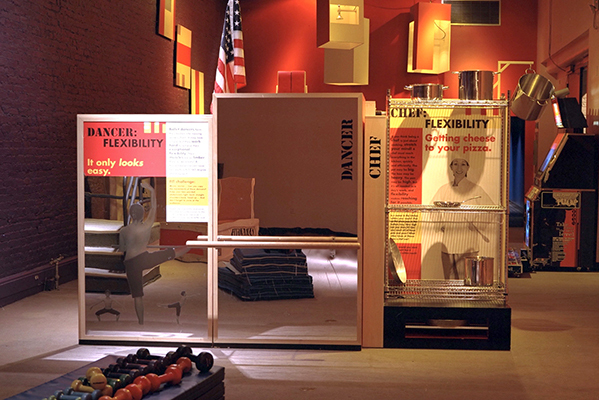 The core box, a series of climb-on interactive activities, explores the notion of who is fit at work. Using everyday heroes, the exhibit celebrates the health and energy of real people: a chef, a firefighter, a ballet dancer, a construction worker and a bike messenger. Kids try out occupations engaging in specific activities that require strength, agility and endurance. Children see if they have the “heart” to be a firefighter with the cardiovascular ability to climb at the rate of 60 steps a minute while carrying and wearing 75 pounds of gear and equipment. Get FIT allows children to challenge their bodies and minds: beating the clock when climbing the stairs while unwinding the hose as fast and far as possible. Visitors discover that chefs are fit too, as they stretch to reach the pots and stack the dishes. Within the fitness experience, children test their strength and flexibility in ordinary ways that they can easily replicate at home. The graphic, appealing experiences of Get FIT capture the attention of children and help reintroduce physical play and well being. Surrounding the core box are colorful shipping crates. Opening them, children discover modular interactive elements that rethink physical activity, from running obstacle courses to yoga sessions. Visitors of all ages find the dance simulation game module irresistible, its lights and pulsating music have everyone dancing up a storm. Children have so much fun exploring Get FIT they forget that they are working out! 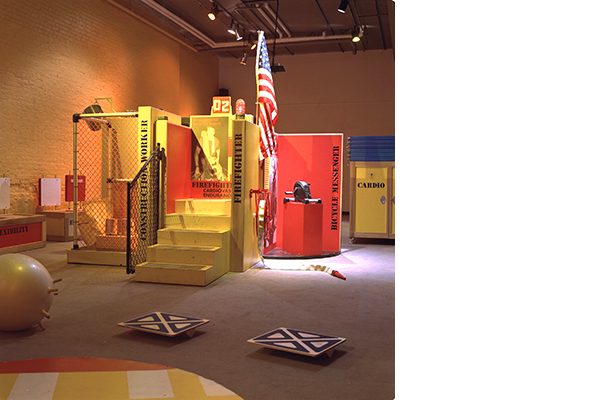 Exhibit Design & Prototype Traveling Exhibit Design: Architecture Is Fun, Inc. Status: Completed 1997 Phase One.